Located in southern Poland near the Czech border, Kraków is the country’s second largest city and an important contributor to its economic and cultural vibrancy. Though the invaded city became the headquarters for Germany’s central government during World War II, it retained much of its historic and architectural integrity, and in 1978 the shining city along the Vistula River was named a UNESCO World Heritage Site. Extensive river paths and well-preserved medieval core ringed by remnants of the city’s medieval walls make running in Kraków scenic and pleasurable. 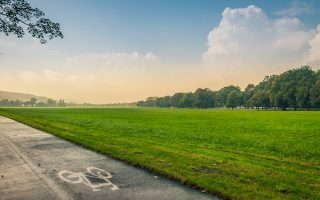 The best places to run in Kraków include the waterfront path along the Vistula,and the one-of-a-kind runseeing tour along Planty Park–a moat-turned-walking path around the city’s historic Old Town. There are also a number of pleasant park runs, including the extensive trails of the Wolski Forest. It’s easy to get around on foot in this compact city, but buses and taxis are accessible and inexpensive options for further flung routes. It all depends on where you stay, but note that many of our routes are close enough to string together for mega mileage and a comprehensive tour of Kraków. Thanks to the long, paved path along the Vistula River, you can run for over 20 miles on the scenic waterfront bordering downtown Krakow. This 4.5 mile stretch right in city center is the best section. Here, we've mapped out longer running options along the Vistula, with segment distances. From the Debnicki Bridge, it's 5.6 km east to the end of Bulwary, or can head west as far as the E40 for a 20 km loop. Few cities make a runseeing tour of the Old Town as simple as Krakow. With “The Planty” the diamond-shaped greenway surrounding Krakow’s historic city center, it’s easy to see the sights on a two mile off-street route. Expansive green space only a few km west of Kraków. 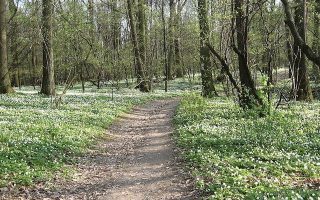 The Wolski Forest is a massive park alongside the Vistula river with over 22 miles (35 km) of earthen trails. Use our 7 km loop or plan your own, combination of forest trails and open spaces. Krakowski Błonia is a large triangular park set against the banks of the Radawa river in the western part of the city. Combined with neighboring Park Jordana, you can get in a solid 3.5 miles along the park’s perimeter. 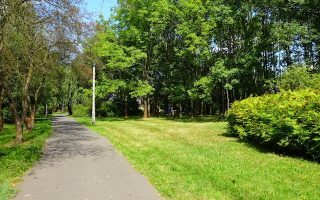 Tucked amid the office buildings in the east of the city, Park Lotników Polskich (Polish Airmen Park) is another of the largest green spaces in the city, and it’s possible to put in well over 2 miles on its labyrinth of cement paths. 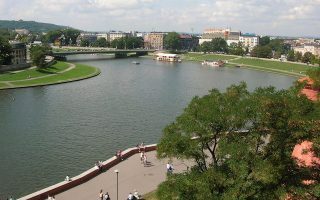 Kraków has a humid continental climate. Winters are cold but not frigid, with average high temperatures in January just above freezing and lows around 20F (-5C). Summers are warm but not hot, with pleasant temperatures in the mid-70s (24C). About 26 inches of rain falls a year. A good number of days in winter see some snow. It’s humid in Kraków, so it can feel damp in winter. Kraków has a large number of hotels at various budget levels. We recommend staying east of the aleja Adama Mickiewicza, for good access to the old city, and The Planty for running. Or, stay closer to the Vistula River paths, on the northern side in the trendy Kazimierz neighborhood, or just on the south side. 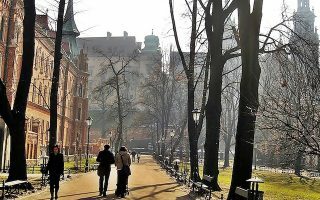 You can find a guide to accommodations and more in Krakow at Krakow.pl. You can find running gear at Sklep Biegacza, with locations in central Kraków and the Kazimierz neighborhood. MikeSPORT has running and cycling clothing. And there are outlet stores for Asics, Nike, and New Balance. There isn’t much info available on public running groups, but you can take a running tour of Krakow with Krakow Running Tours. Find Krakow’s most popular running events here.